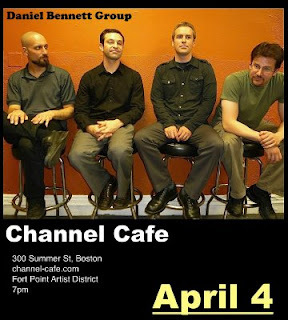 Saxophonist Daniel Bennett is playing at the The Channel Cafe (300 Summer St.) this Saturday at 7 PM. Boston saxophonist Daniel Bennett (www.danielbennettgroup.com) is most known for his unique musical mix of jazz, folk, and minimalism. This "Folk-Jazz" style has earned the Daniel Bennett Group a dedicated cult following in both jazz and folk circles. The Daniel Bennett Group has shared concert stages with Bill Frisell, the Charlie Hunter Trio, Billy Martin (Medeski, Martin and Wood), David Fiuczynski (Screaming Headless Torsos), and Denison Witmer.